All these problems have been resolved in FFED3D which should be the version you run anyway, unless you want to play the bug-fest that is DOS FFE! 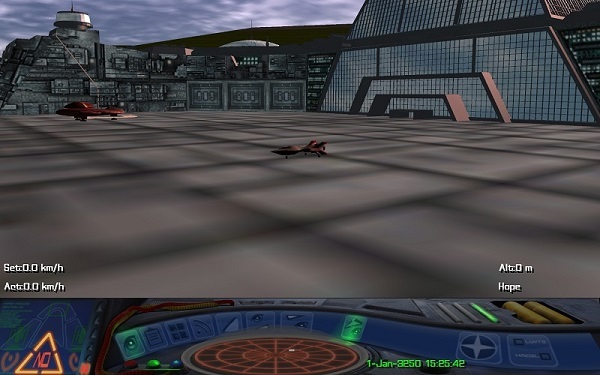 Quite often when carrying out a mission, you'll be sent to one of the outlying systems where the outdoor starports have only two landing pads, since the volume of traffic here is less than in the core systems. 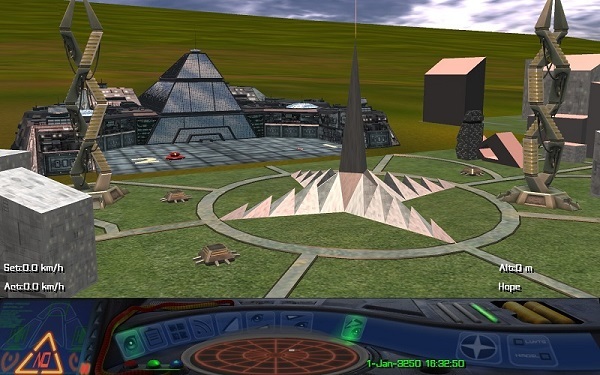 This pictures shows Old Blackelk starport in the Gateway system, but similar places have been built throughout the galaxy. If you arrive at such a starport and land on one of the pads, you will sometimes find that the second pad is occupied by someone other than your intended victim. If this happens then when your target does arrive they will be informed by flight control that all the landing bays are full. They will not attempt to land rough, they will simply leave the area altogether. To prevent this happening, disengage your autopilot and land rough somewhere a couple of km from the port, where you can watch ships arrive and depart. This is a good idea even if both pads are empty since it improves the chances of a pad being available when your target arrives. If both pads are occupied when you arrive then you have a bigger problem. The ships currently docked may not leave for a long time, possibly after your victim is due. If this happens then you have no option but to re-load your last savegame. A good rule of thumb is to always save your game before taking on a mission, in case something goes wrong. This is probably the trickiest mission to complete successfully, simply because your target fails to appear so often. It seems that timing is crucial on this one, as mentioned in the FrontierAstro Mission Guide. Make sure you arrive 6 or 7 days before the mission date, and dock as normal at the station. Depart around two minutes before your mission time and get a safe distance away from the station. The orange docking lights around the station entrance should go out when you're far enough away. Keep a careful watch on the station. 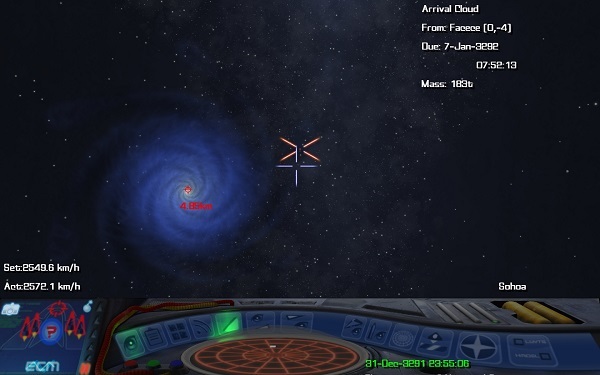 Sometimes, even though you have your ship id system switched on, the computer fails to pick up the departing ship, and the first you'll know about it leaving is when the hyperspace departure cloud appears! This need not be a problem if your ship is fast enough and you have a hyperspace cloud analyser as you can follow them through hyperspace and destroy them in another system. 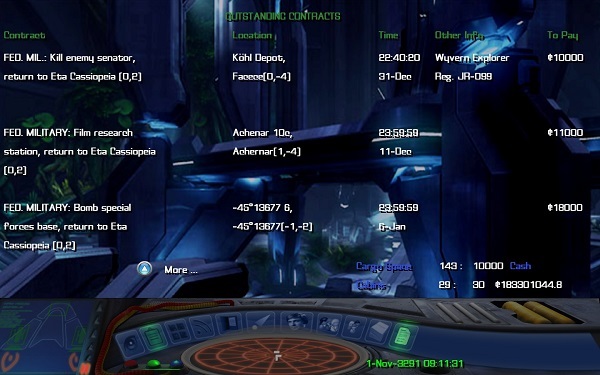 But you can also save time and kill them here by keeping an eye on your scanner, as it will normally show the departing ship even if your id system doesn't. If your victim doesn't appear at all, try re-loading your last savegame and wait a day or so longer before departing for your target system. This situation crops up on classified missions for the Imperial and Federal navies and seems to happen most often to Commanders who have, shall we say, modified their ships somewhat, in a manner which the authorities would not approve of. Due to these alterations, missiles sometimes have trouble during launch and detonate unpredictably. It is helpful to note that this is not a major problem and in any case, the satellite MUST always be destroyed since failure to do so will result in your ship's ID being broadcast to every pirate in every system, permanently! On many occasions, the problem seems to rectify itself simply by switching to an exterior view prior to launching the missile. 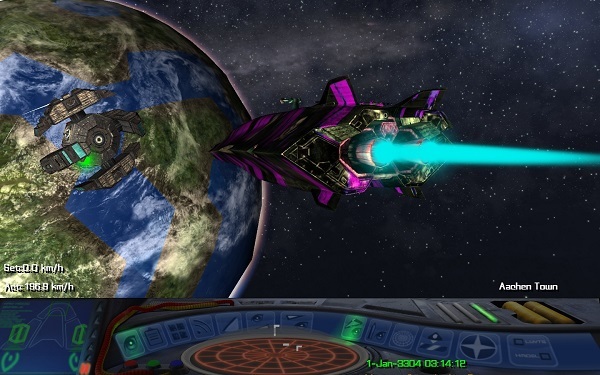 If this doesn't help, allow the missile to explode anyway, and thanks to the fact that the satellite was damaged by the detonation, you will be able to finish it off with your standard beam lasers. 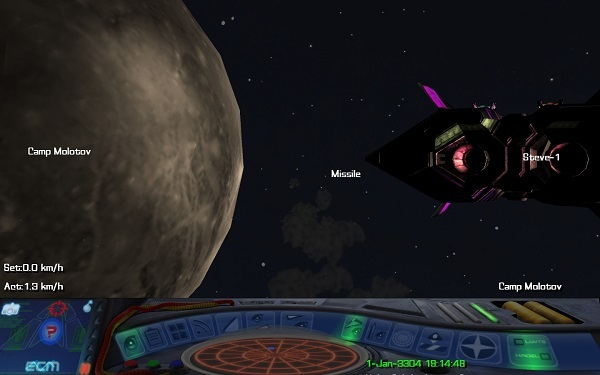 By the way, if your missile did launch ok but seems to be taking an eternity to reach the target, engage Stardreamer at level 3 or above and your missile will do its job immediately. 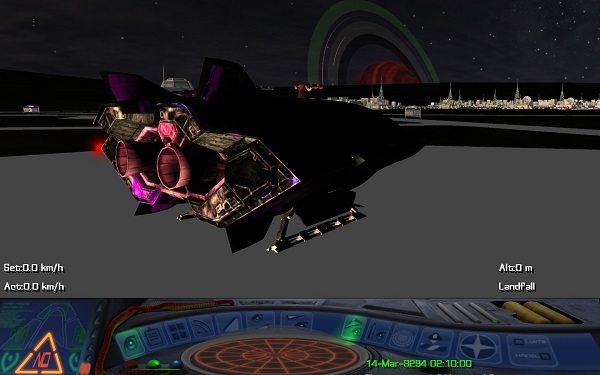 Following your victim through hyperspace and attacking them when they arrive there is a very neat way of avoiding the inevitable criminal record you acquire via normal methods. It requires more time to perform however and is dependent on your ship having a greater jump range than that of your target. Sometimes you do everything right and they don't appear at the other end. The normal reason for this is a hyperspace mis-jump. Every Commander knows that mis-jumps can and do occur, usually as a result of a poorly-serviced hyperspace drive. If this has happened to your victim then there is nothing you can do as you have no way of knowing where they mis-jumped to. 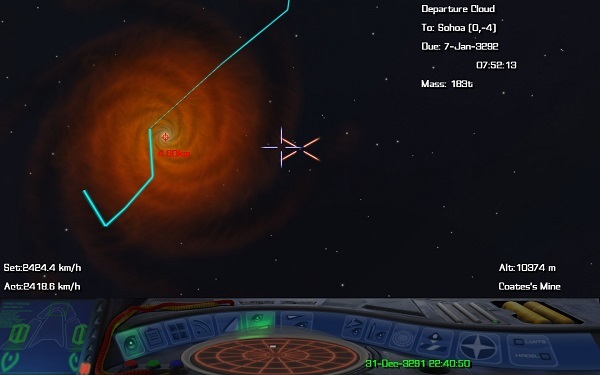 If the other ship thought you were after them as they departed the first system, they may have deliberately induced a mis-jump in order to evade you. This works because your hyperspace analyser only tells you where they were originally intending to jump to and cannot read a mis-jump. This is an extremely dangerous thing for them to have done though, as a mis-jump can send them literally anywhere in the galaxy! I'm told I've failed the mission, but I haven't attempted it yet ! 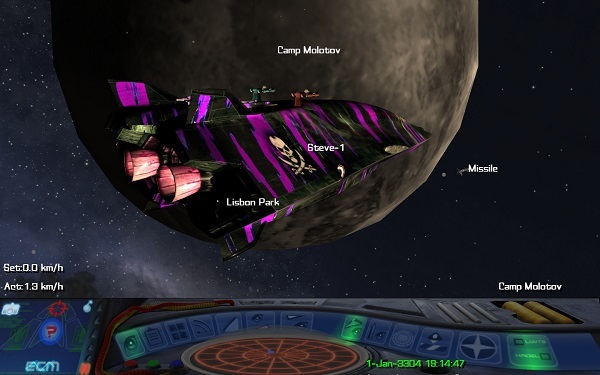 Frontier offers many types of exciting missions for the two military organisations, but if you've got a busy schedule, as shown on the left, you may need to dock at other systems between missions before you return to the place where you took on the missions. Normally this is not a problem as the military recognise that the deadline has not passed and wait patiently until that point before accusing you of failing if the mission is not done. This ties in with the problem of getting your nuclear missiles to hit the satellite in the classified military missions. A number of ships seem to have great difficulty in launching the nukes properly - the missile often detonates almost as soon as it is launched or drifts aimlessly away from its intended target. When your are attempting to destroy an enemy base, it seems to get even more difficult and there is no single way of correcting the situation. 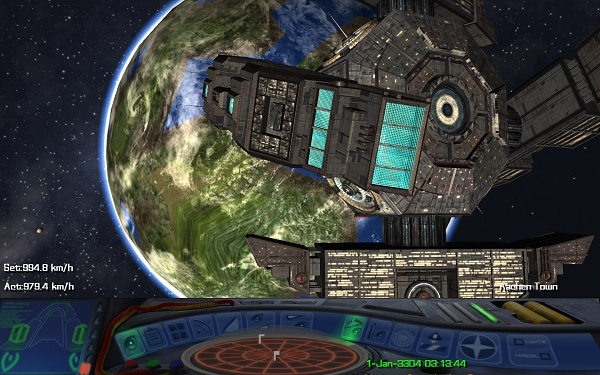 One method, as shown on the left, is to level out a few thousand metres above the planet's surface and travelling at a moderate speed switch to your bottom turret view. Then let the missile go when you are directly over the target and accelerate away. Another tactic is to leave yourself further above the surface and switch to Stardreamer level 3 just after you launch the missile. However, it is vitally important that you point your ship away from the planet and make sure your velocity is taking you away from the surface as well, as engaging accelerated time can be very dangerous in close proximity to a planetary body. Also, if there are a lot of enemy ships around you may find their presence prevents you from activating the Stardreamer. A bit of trial and error here, I'm afraid.